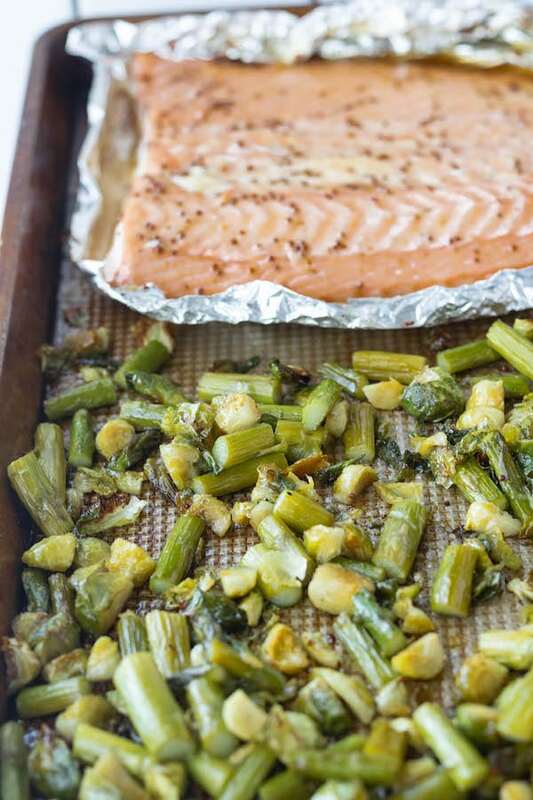 This maple salmon sheet pan dinner is the perfect weeknight dinner. Done in under 30 minutes, loaded with vegetables and dripping with maple glaze. Hiya, friends! Just checking in to make sure your New Years is getting off to a great start! I am dedicating January to quick and easy meals. 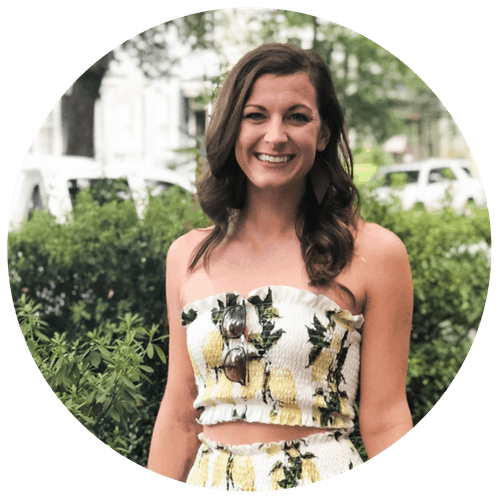 Instant pot, slow cooker, one sheet pan meals, quick salads, foil pack dinners- you name it! So today I’ve brought you this Maple Salmon Sheet Pan Dinner. It is stocked with vegetables, so you won’t have to worry about making up a separate pan just for the veggies. Also if you love salmon, check out these salmon burgers… I’m not drooling, you’re drooling! I’ve been slammed at work this week. 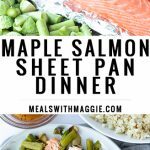 This maple salmon sheet pan dinner was so easy that even my husband could start it for us before I got home, making life SO much easier. 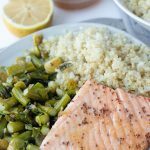 I paired this maple salmon sheet pan dinner with some cauliflower quinoa rice. I love to buy cauliflower rice at Aldi, only $1.69 in the freezer section! Can’t beat that. How many of you shop at Aldi? I have big Aldi love, been in a relationship since 2010. 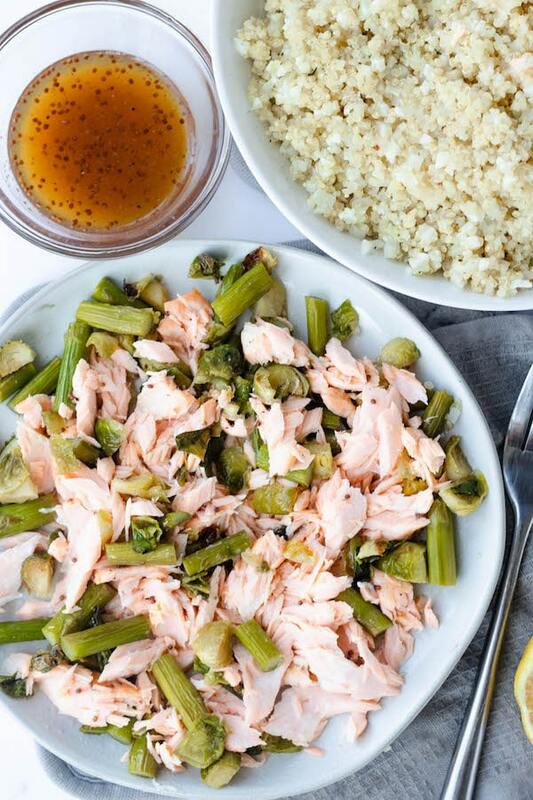 Salmon: Healthy fats, loaded with protein. I buy Costco salmon since we eat it about twice a week. Brussel sprouts and asparagus: High in fiber, vitamin K and antioxidants. You can use different vegetables here, but keep in mind that the bigger the vegetable the more steamed it might get on the sheet pan. MAPLE GLAZE: I’m drooling just thinking about it. 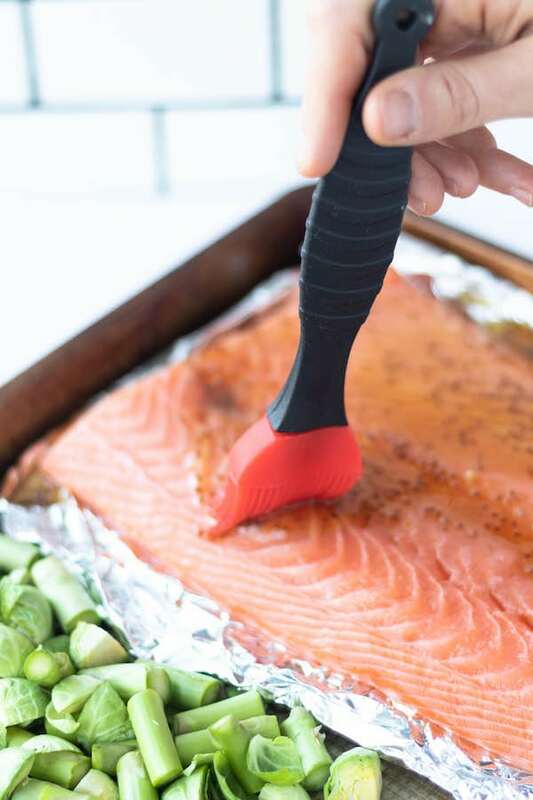 Use half on the salmon and save half for later. Cauliflower Quinoa: Boil 1 cup quinoa and mix with 2 cups of cauliflower rice. For convenience you can find the cauliflower rice in the freezer isle! Let me see your creations! 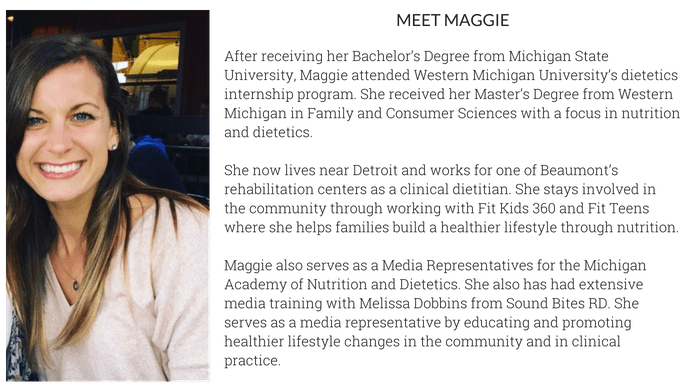 Follow @mealswithmaggie on instagram! Whisk ingredients for maple glaze in a small bowl and set aside. Prepare a sheet pan by placing foil on one half of the pan, which the salmon will lay on top of. Place cut up vegetables on other side of pan. Toss vegetables in EVOO, garlic powder, salt and pepper. Pour half of maple glaze on salmon and brush to coat salmon evenly. Bake for 10 minutes in oven at 400F. After time has finished, stir vegetables and put back in oven for 5-8 more minutes. 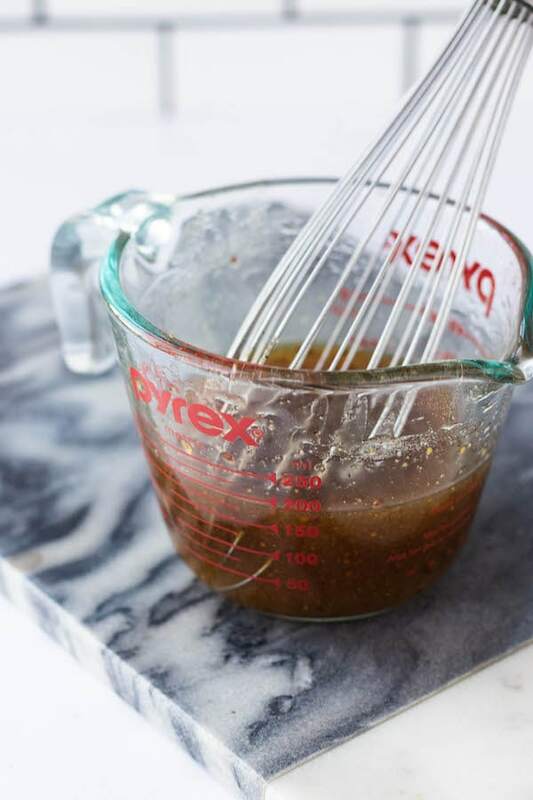 Remove from oven, garnish with lemon juice and remaining glaze. Enjoy! Other vegetables will work, but keep in mind too many vegetables on the sheet pan will cause them to steam instead of roast, resulting in a softer texture.